Red figure amphora by the Nixoxenos painter in the Robinson collection. 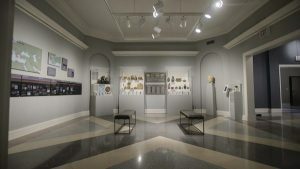 The reopened Buie West Gallery housing the introductory displays for the new installation of the Robinson Collection. Photo by Marlee Crawford/Ole Miss Communications. The project began its design phase in the Summer of 2013, and the first room of the new installation opened in March 2018, but the Museum is still in need of resources and partners to complete the world-class reinstallation the collection deserves. If you’d like to learn more about the reinstallation project or make a donation to the David M. Robinson Memorial Collection Conservation Fund, please contact Ms. Melanie Munns, Special Project Manager (mjmunns@olemiss.edu) or Ms. Angela Barlow, Development Officer (ambarlow@olemiss.edu). The David M. Robinson Memorial Collection of Greek and Roman Antiquities, housed in the University Museum, is available to students for study and research. 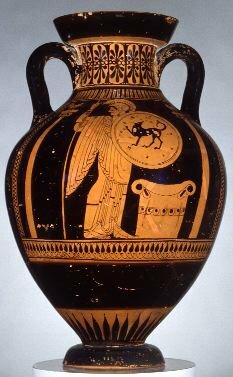 In addition to the extensive collection of Greek vases of all periods, Greek and Roman sculpture, bronzes, terracottas, inscriptions, coins, lamps, and household objects, there are collections of potsherds dating from the Neolithic Age to the Late Roman Empire. In all, there are more than 2,000 objects in the collection and many need further study. Students are encouraged to make use of these collections in their classwork and research. The Robinson Memorial Collection is considered to be the best of its kind in the South. Professor David Moore Robinson. Oil portrait by Stanislav Rembski, 1952. The Robinson Collection came to the University in part through the bequests and gifts of Professor Robinson and his widow Helen Tudor Robinson, but the bulk of the collection was purchased from the estate of Mrs. Robinson and given to the University by Mr. and Mrs. Frank Peddle of Oxford whose generous gifts continue to make them two of the University’s major benefactors. Professor Robinson also bequeathed to the University his extensive collection of books and papers most of which are housed in the John Davis Williams Library. Robinson’s excavation notes and records from his famous exploration of Olynthus are maintained in the University Museums. Multiple images of 48 of the Robinson vases can be viewed in the Perseus Digital Library’s Art and Archaeology collection. In addition to the Robinson Collection, the University Museums possess two other collections of antiquities–Roman medical instruments (a gift of the medical alumni of the university) and the James Rubright Collection which contains coins, lamps, vases and sculpture. Other antiquities have been presented to the Museums by the Department of Classics.